Remgro is committed to the highest level of corporate governance, integrity and ethics. The Board of Directors (the Board) is ultimately responsible for ensuring that governance standards are met and it is therein assisted by senior management who aim to instil a culture of compliance and good governance throughout the Remgro Group. This is underscored by sound and visible leadership characterised by the ethical values of responsibility, accountability, fairness and transparency. Sound corporate governance structures and processes are being applied and are considered by the Board to be pivotal to delivering sustainable growth in the interest of all stakeholders. The Board advocates adherence to sound governance principles by all entities Remgro is invested in by using its significant influence to ensure that all Remgro’s listed subsidiaries, joint ventures and associated companies endorse the principles contained in the King Report on Governance for South Africa 2009 (King III). Effective corporate governance forms part of Remgro’s investment assessment criteria which are further monitored on a continuous basis by non-executive board representation on those investee companies’ boards. Remgro is an investment holding company and accordingly all references to “the Group” in this context denote the Company and its wholly owned subsidiaries. Since the disposal of TSB to RCL Foods during January 2014, Remgro’s main wholly owned operating subsidiary is Wispeco. Wispeco is operated and managed as an independent entity with an autonomous board of directors, however, the composition of its board does not comply with the independence requirements of King III due to the size of the business. Remgro’s representatives on the board of that company, however, ensure that sound corporate governance and sustainability practices are followed by Wispeco through the adoption and implementation of Remgro’s policies, processes and procedures. Remgro’s other wholly owned subsidiaries, excluding Wispeco referred to above, are not operating companies and are administered by Remgro Management Services Limited (RMS). The members of Remgro’s Management Board are also the directors of RMS. RMS renders management and support services to Remgro and certain of its subsidiaries, joint ventures and associates and partially recovers its costs through fees for services rendered. The net costs of RMS are part of the corporate costs of Remgro. The Board is satisfied that Remgro has met the majority of the principles contained in King III throughout the year under review. When a principle of King III has not been adhered to as specified, this is explained where relevant. For ease of reference, however, a summary of all the principles of King III that were not applied is presented below. The Chairman of the Board, Mr Johann Rupert, is not an independent non-executive director but, given his knowledge of the business and his commercial ex­perience, the Board deems this arrangement not only as appropriate but also essential for achieving the business objectives of Remgro. The Chairman of the Board acts as ex officio chairman of the Remuneration and Nomination Committee. Although he is not independent the Board is supportive of his chairmanship of the Remuneration and Nomination Committee given the necessity to align the Company’s remuneration approach with corporate strategy. The Chairman receives no remuneration or fees from Remgro. The Board and subcommittees are evaluated annually, but have decided not to disclose the overview of the appraisal process, results and action plans in the integrated report due to the potential sensitive nature thereof. In terms of the Board’s annual evaluation process, directors are not evaluated individually. Independent non-executive directors are, however, evaluated indivi­dually with regard to their independence and specifically the independence of the directors serving on the Board for more than nine years. In terms of King III, the integrated report should disclose the terms of reference of the Board committees; however, only a summary of the terms is disclosed in the integrated report. The complete terms of reference of Board committees are available here. The Board does not believe that directors should earn attendance fees in addition to a base fee. Many directors add significant value to the Group outside of the formal Board and Committee meetings, sometimes greater than they might do within the confines of a formal meeting. The Board does not intend to ask the shareholders for non-binding approval for Remgro’s remuneration policy. The rationale and basis for the Group’s executive remuneration policy is carefully considered by the Remuneration and Nomination Committee and is disclosed in the Integrated Annual Report. The Board does not intend to institute a formal dispute resolution process as it believes that the existing processes within the Group operate satisfactorily and do not require a more formal and separate mechanism. Shareholders have remedies in terms of the Companies Act. The King III Report recommends that the Company’s Sustainable Development Report be audited by an independent external professional party. Remgro’s Sustainable Development Report has not been audited but verification of the key sustainability indicators has been obtained through agreed upon procedures performed by internal audit and independent service providers. An index on the Company’s application of each King III principle is available here. The Board is further satisfied that the Company has met the requirements of the Companies Act (No. 71 of 2008), as amended (Companies Act), and the Listings Requirements of the JSE Limited. Compliance with all relevant laws, regulations, accepted standards or codes is integral to the Group’s risk management process and is monitored on a continuous basis. As in previous years there has been no major non-compliance by, or fines or prosecutions against the Group during the year under review. Remgro measures the effectiveness of its governance processes by means of continuous successful participation in the JSE’s Socially Responsible Investment (SRI) Index since the launch thereof in May 2004. In this regard the governance practices of RCL Foods Limited, being Remgro’s largest and only listed subsidiary, as well as those of Wispeco, are incorporated. serve as a reference for new directors. All directors of Remgro have endorsed the charter and a copy of the charter is available for inspection on Remgro’s website. For details of the directors of the Company click here. The composition of the Board reflects a balance of executive and non-executive directors, of whom the majority are independent, in order to ensure that there is a clear balance of authority so that no one individual has unfettered decision-making powers. 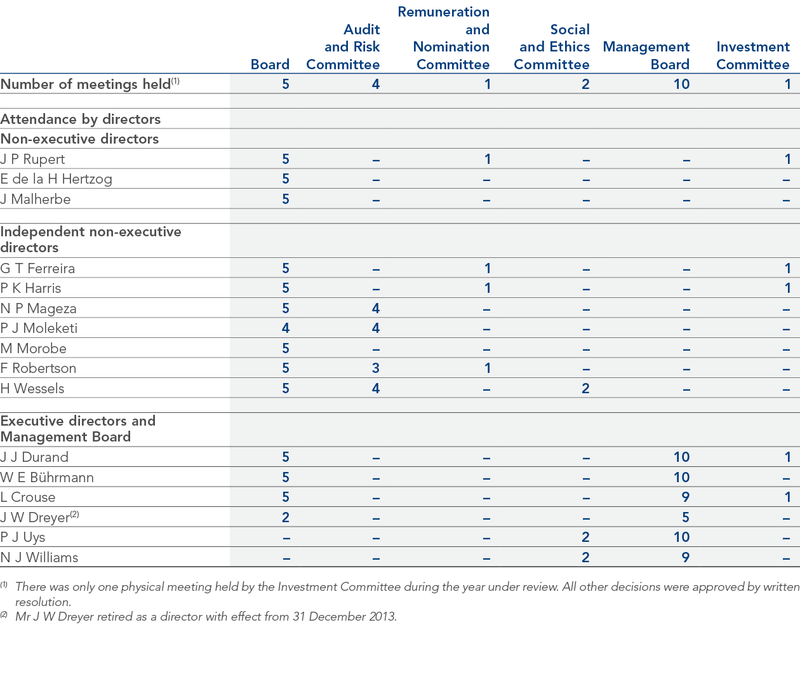 As at year-end the Board consisted of three executive and ten non-executive directors of whom seven were independent. Non-executive directors are selected to serve on the Board for their broader knowledge and experience and are expected to contribute effectively to decision-making and the formulation of policy. The independence of independent non-executive directors is reviewed annually and the independence of non-executive directors who have served on the Board for more than nine years, is subject to a rigorous review by the Board. The Board will not comprise fewer than six or more than nineteen directors, or any other number as the Board may from time to time determine. The Board is satisfied that its current members possess the required collective skills and experience to carry out its responsibilities, to achieve the Group’s objectives and create shareholder value over the long term. In terms of the Memorandum of Incorporation of the Company at least one third of the directors must resign annually on a rotation basis, but may make them­selves available for re-election for a further term. The directors to retire shall be those who have been longest in office since their last election. A director who has already held his office for a period of three years since his last election shall retire at such meeting. The roles and responsibilities of the Chairman of the Board and the Chief Executive Officer are separated. The Chairman, the Deputy Chairman, the Chief Executive Officer (CEO) and the Chief Financial Officer (CFO) are all elected and/or appointed on an annual basis. As mentioned earlier, the Chairman of the Board is not an independent director. The Board acknowledges the principle in the King Reports to appoint an independent non-executive director as Chairman but, given the responsibility of the Board to focus on performance in directing the commercial and economic fortunes of Remgro, this arrangement is deemed not only appropriate, but also essential. In compliance with King III and the JSE Listings Requirements, the Board has reappointed Mr G T Ferreira as Lead Independent Director (LID) on 3 December 2013. The main function of the LID is, inter alia, to provide leadership and advice to the Board, without detracting from the authority of the Chairman, when the Chairman has a conflict of interest. The LID is appointed by the Board on an annual basis. The CEO, Mr Jannie Durand, is responsible for the day-to-day management of the Company and he is assisted in this regard by Mr Leon Crouse (CFO). Between the two of them they have 46 years of service working for Remgro and Remgro-related businesses. The Board is satisfied with the independence of independent non-executive directors, including the independence of Messrs Fred Robertson and Paul Harris, who have served on the Board for thirteen years. Based on the evaluation there is no evidence of any circumstances and/or relationships that will impair their judgement, and their independence is in no way affected by the length of service. Newly appointed Board members are formally informed of their fiduciary duties by the Company Secretary. Upon their appointment directors receive an induction pack consisting of, inter alia, agendas and minutes of the two most recent Board and subcommittee meetings (if applicable), latest annual financial statements and Integrated Report, the Company’s code of conduct regarding insider trading, Group structure, Board charter and subcommittee mandates, etc. in order to inform them of existing matters and risks that are currently being addressed as well as to provide them with a general understanding of the Group. New Board members are also invited to have induction meetings with executive directors and senior management. In addition new members will also receive information on the JSE Listings Requirements and the obligations therein imposed upon directors. All directors have unlimited access to the services of the Company Secretary, Mrs Mariza Lubbe, who is responsible to the Board for ensuring that proper corporate governance principles are adhered to and that Board orientation or training is given when appropriate. During the year under review the Board has expanded its annual evaluation process of the Board, subcommittees and directors, by also including an annual evaluation in respect of the Company Secretary. The evaluation process includes an assessment by each Board member of the Company Secretary’s eligibility, skills, knowledge and execution of duties. The Board has considered and is satisfied that the Company Secretary is competent and has the necessary experience to effectively execute her duties. A brief curriculum vitae of the Company Secretary is available here. The Board confirms that the Company Secretary maintains an arm’s length relationship with the Board and the directors, taking into account that the Company secretary is not a director of the Company and is not related to any of the directors. The Board has established subcommittees to assist it in discharging its duties and responsibilities. Each committee has its own mandate/terms of reference that defines its powers and duties. Copies of these mandates and terms of reference, which are reviewed on an annual basis, are available on Remgro’s website. Remgro’s remuneration principles are set out in the Remuneration Report. As mentioned earlier the Board does not intend to ask shareholders for a non-binding advisory vote on the Company’s remuneration policy at the forthcoming Annual General Meeting on 25 November 2014. The committee is governed by a mandate that includes the recommendations of King III and the requirements of the Companies Act. The committee consists of four independent non-executive directors, elected by Remgro’s shareholders on recommendation by the Board, and is chaired by Mr Herman Wessels. The committee meets at least four times a year and the CEO, CFO and the head of internal audit attend all meetings, ex officio. The composition of and attendance at committee meetings are set out here. The annual appointment of the external auditor, the approval of its terms of engagement and audit approach, as well as the approval of fees relating to audit services and non-audit services are also performed by this committee. These responsibilities apply to Remgro and its subsidiaries administered by RMS. The Audit and Risk Committee of Remgro’s only remaining wholly owned operating subsidiary, Wispeco, reports to the Group’s Audit and Risk Committee at each meeting by way of including its minutes of meetings in the agenda. The Audit and Risk Committee meets at least once per year with the external and internal auditors and executive management to ensure that their efforts relating to risk management and internal control are properly coordinated. The committee furthermore evaluates the effectiveness of its subcommittee, the Risk and IT Governance Committee. This committee’s mandate includes the maintenance of the Risk Management Policy and plan, establishment and maintenance of an operational risk register, information technology risk management, legal compliance and occupational health and safety. A Financial Statements Committee, which is not an official subcommittee of the Audit and Risk Committee, was also established. Its tasks include the revision of Remgro’s Integrated Annual Report (including the annual financial statements) prior to submission thereof to the Audit and Risk Committee Both of these committees are chaired by Remgro’s CFO, Mr Leon Crouse, and the chairman of the Audit and Risk Committee attends the meetings by invitation. The committee’s report describing how it has discharged its statutory duties in terms of the Companies Act and its additional duties assigned to it by the Board in respect of the financial year ended 30 June 2014 is available here. The Investment Committee comprises four non-executive directors, of whom two are independent, as well as the Chief Executive Officer and the Chief Financial Officer. The committee is chaired by Mr Johann Rupert and meets when required for significant investment decisions. The composition of and attendance at committee meetings are set out here. There was only one physical meeting held by the Investment Committee during the year under review. All other decisions were approved by written resolution. The Management Board consists of all three executive directors as well as two members of senior management, Messrs Neville Williams and Pieter Uys. The committee meets on a monthly basis and the duties and responsibilities of committee members are in addition to their duties and responsibilities as members of the Board (in the case of members who are directors) and/or their other duties as executives. The composition of and attendance at committee meetings are set out here. Directors and designated employees may only deal in Remgro’s securities outside the closed period, with the approval of the Chairman or the Chief Executive Officer. In addition, directors and designated employees are prohibited from dealing in the securities of listed investee companies unless permission has been obtained from the Chairman or the Chief Executive Officer. The Board has implemented a comprehensive risk management system, which incorporates continuous risk assessment, evaluation and internal control embed­ment. The Group’s reporting on its risk management process and systems of internal control is included in the Risk Management Report. The Board acknowledges the importance of keeping shareholders and the investor community informed of developments in Remgro’s business. Communication with shareholders is based on the principles of timely, balanced, clear and transparent information. Both positive and negative aspects of financial and non-financial information are provided. Interactions with institutional investors take place twice a year at the dial-in interim and final results presentations, where questions can be directed to the CEO and CFO. The most recent and historic financial and other information is also published on the Company’s website. Further information regarding Remgro’s initiatives on communication with all of its stakeholders is provided in the Sustainable Development Report.